The Amazon Elastic Transcoder gives you the power to convert or transcode media files from one format to another, making it possible for you to create files that are compatible with smart phones, tablets, PCs, and other devices without having to worry about servers, storage, scalability, or a host of other issues. We are adding audio transcoding support to the Elastic Transcoder today. You can transcode existing audio files (e.g. music and podcasts) to new formats, and you can strip out the audio tracks from video files to create audio-only streams. You can use this option to create audio podcasts from video originals and to support iOS applications that require an audio-only HTTP Live Streaming (HLS) file set. You transcode audio files in much the same way that you transcode video files. You create a transcoding pipeline (or use an existing one), and then create a transcoding job. The transcoding job can use one of the new audio transcoding system presets or your own custom presets. You can create audio output using the AAC, Vorbis, or MP3 codecs. Audio transcoding is billed at the rate of $0.0045 (less than 1/2 of a cent) per minute of audio output in the US East (Northern Virginia) Region; see the Elastic Transcoder Pricing page for information on pricing in the other AWS Regions. 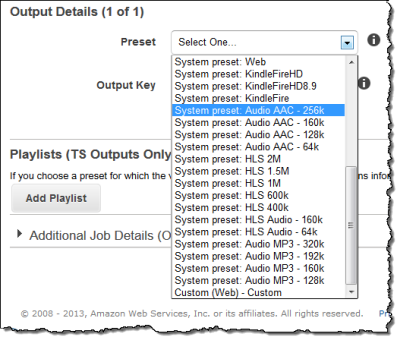 You also get 20 minutes per month of audio transcoding as part of the AWS Free Usage Tier. As always, this new feature is available now and you can start using it today!